Gold will probably trade in a range of $1,200 to $1,300 an ounce in the short-term as the metal tracks U.S. real interest rates, according to UBS Group AG’s wealth management unit. Bullion climbed almost 9 percent in the first quarter, buoyed by worries over Donald Trump’s presidency and geopolitical risks. Prices have since fallen and posted their first monthly decline this year in June. On Monday, the metal fell the most since November as equities and bond yields rallied, before North Korea’s launch of what the U.S. said was an intercontinental ballistic missile sparked a small rebound. The price was at $1,222.05 on Wednesday. If U.S. unemployment keeps falling, and the Federal Reserve keeps raising interest rates no matter what the inflation data show, that will be negative for gold in the short term, Gordon said. Still, solid demand this year and weaker output, coupled with a lower dollar, are positive for prices, he said. If equity valuations start to drop, investors could turn to gold too, he added. 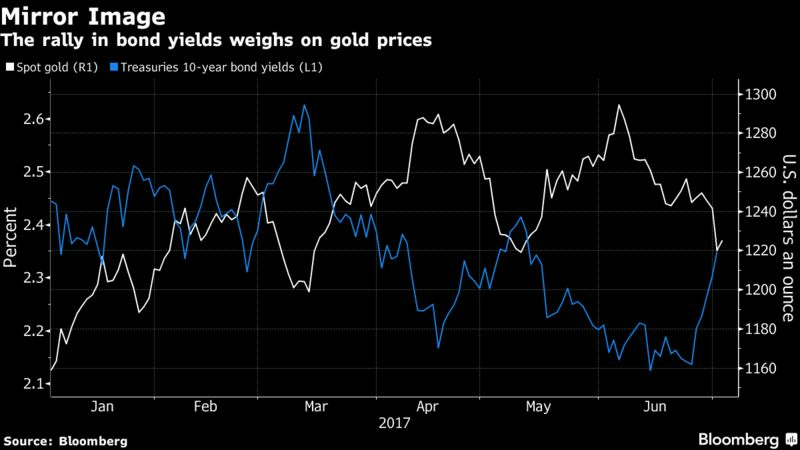 Gold could also act as insurance if the labor market doesn’t show further improvement in the U.S. and inflation doesn’t pick up, which would make the Fed pause on its tightening path, or if global growth slows, said Gordon. “We like the insurance qualities for gold just from an unknown perspective at these sorts of levels,” Gordon said. Bullion rose as much as 0.7 percent in two days after North Korea’s rocket launch revived geopolitical concerns. U.S. Secretary of State Rex Tillerson called the act a “new escalation of the threat” and the United Nations Security Council plans a closed session later Wednesday after a U.S. request. Gold will probably range from $1,150 to $1,350 in the second half, depending on how global equity markets perform, whether Trump can implement his agenda and the strength of the dollar, Robin Tsui, an exchange-traded fund gold specialist with State Street Global Advisors, said in Hong Kong Tuesday. Investor holdings in the SPDR Gold Trust, the biggest ETF backed by bullion, have shrunk to 846.29 metric tons, the lowest level in almost three months.